The Muny in St. Louis is one of the nation’s oldest theatres. In 2018, it celebrated its 100th anniversary.As part of the celebrations, the Muny scheduled a production of Jerome Robbins’ Broadway, a compilation of some of the top dance numbers from Broadway shows choreographed by the acclaimed artist, running from On the Town to West Side Story to Fiddler on the Roof. As blogger Chris Peterson observes, “The show, which serves as a tribute anthology to shows that Robbins worked on, features fully produced recreations of his choreography. That means these numbers are done in the context of the shows they’re from and with full costuming.” As directed by a cast member of one of the original productions, Cynthia Onrubia (who is Filipina), this was supposed to be a faithful recreation as a tribute show. Too faithful, perhaps. From various sources, the production faithfully replicated the original dance numbers down to the casual racism and sexism that permeated so much American culture of the mid 20th Century. White performers played the role of Puerto Rican Jets from West Side Story, white mosailors pretended to be Native Americans in a mocking manner and sailors got prospective dates drunk, presumably to have their way with them. Of particular interest, is that the Uncle Tom’s Cabin number from The King and I was included. And cast as Tuptin, a Burmese concubine, was Sarah Bowden, an Australian woman who was definitely not of an Asian background. There were a number of things wrong with this, beyond the obvious. First, Ms. Bowden replicated the dialogue from The King and I, complete with a very bad accent (a curious choice for the King and I, since it’s supposedly in Thailand and in the country’s native tongue. As David Henry Hwang’s Soft Power points out…how does this make sense?). 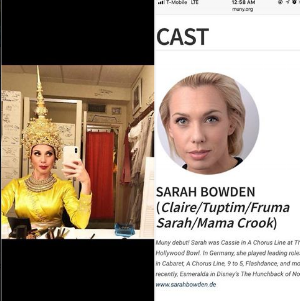 Second, Ms. Bowden is playing Tuptin as a Thai native (with accent, in full costume); this is a sloppy choice if you wanted this particular actor–if the book is adjusted to play her as a Southern native, there is no casting problem then. However (and third), the production actually cast four Asian Americans in the production. Why Tuptin had to go to Bowden is not clear. There is speculation that this actor has to play other roles (taken from On the Town and Fiddler on the Roof), the casting was appropriate. However, this excuse fails to make sense since a) there ARE Chinese Jews and b) the On theTown role was for a New Yorker (who had Asians even in the 1940s…because, the ORIGINAL romantic lead in On the Town was Japanese American). Getting wind of this odd-headed productions, members of the Consortium of Asian American Theaters and Artists (CAATA), the national organization advocating for Asian American theatre artists decided to take action. In St. Louis for the national meeting for the Theatre Communications Group (the national organization for non profit theatres), these CAATA members, along with members from other ethnic groups, attended the Friday showing and staged a noisy protest during the yellowface scene and walked out from the theatre. According to some advocates, while it was regrettable that the performance was disrupted, it was a tactic of last resort as earlier attempts to resolve this issue within the cast were brushed aside (and that an assertive, outside commentary was necessary). The (ahem) respectable Wall Street Journal weighs in. The Consortium of Asian American Theaters and Artists (CAATA) had a response to the Muny. Theaters of Color at the Theatre Communications Group Convention in St. Louis also responded to the Muny.